I’m sorry to say it, but I’m glad to see the back of the poppy season. The omnipresence of poppies on television, the competitive patriotism of the tabloids and the increasingly reflexive tendency to refer to all servicemen as ‘heroes’ has made me a bit twitchy over the past few years, but it was really brought into focus by the ludicrous storm in a teacup over FIFA’s refusal to let England team wear shirts with poppies on them. Perhaps most creepy was hearing that both the sports minister and David Cameron had described the poppy as ‘a symbol of national pride’, which I found genuinely unnerving. Unnerving because when you come from the same culture as someone, you assume that there are some basic cultural touchstones whose meaning is well-established and uncontroversial. I thought everyone brought up in this country agreed that the poppy was a symbol of remembrance for those killed and injured in war; David Cameron saying it is a symbol of national pride is as unexpected as if he said that on a traffic light, red means go. The whole thing would make me even more uneasy if I thought there was any chance that all this very public symbolism had much chance of turning into anything more sinister. Because if Britain had a history of military coups, I would be wondering if we were heading for the point where we wake up one morning to find a tank parked on the doorstep of 10 Downing Street and a TV bulletin with a man in uniform announcing that, for the sake of national stability, the army had reluctantly found it necessary to install themselves in a transitional government which would of course be strictly temporary. But we are not that country, and I don’t think that all the slightly shrill rhetoric about sticking up for our boys is really militaristic in origin. It’s that ‘our boys’ have done an awful lot of fighting over the past few years, in wars which no one is very enthusiastic about any more. Thankfully they’re out of Iraq, which started to seem stupid, ill-conceived and counterproductive almost immediately, but Afghanistan just keeps grinding on for year after year and it becomes harder and harder to see what the point is. And on top of that, although it’s something the the tabloids are unlikely to say out loud, there’s the sense that the British forces haven’t actually enhanced their reputation; that they went in with a lot of big talk about their professionalism and expertise in counterinsurgency, and ended up having to be bailed out by the Americans. So there’s a deep well of anxiety associated with the subject of our armed forces. And if it was a conscript army currently fighting in Afghanistan, that anxiety would probably be expressed directly as anti-war protests. Instead it gets manifested as an insistence that all our fighting men are ‘heroes’ by definition, and as ever more elaborate public displays of support. However, even if the whole business is, in the end, mostly harmless, it still makes me twitchy. Hopefully now Remembrance Sunday has passed for another year, the press will at least turn down the intensity a couple of notches — although the Mail and the Mirror both have front page headlines about ‘our heroes’ today, so perhaps I’m being too optimistic. 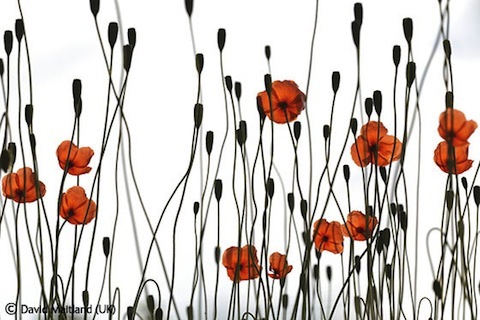 » The photo, Fading Beauty, is © David Maitland and was Specially Commended in the ‘In Praise of Plants and Fungi’ category in the Wildlife Photographer of the Year competition 2011.